Here at my Home Bar, aka my Kitchen, I love to cook and bake as well as make fabulous cocktails! 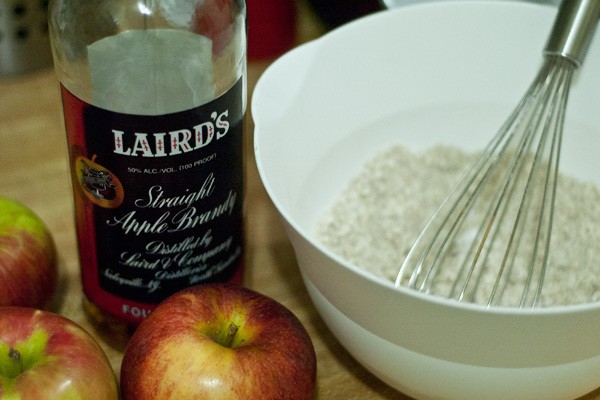 Inevitably, the booze finds its way into my cooking which means Boozy Booze Booze in my baked treats! Woo! This is: Cookin’ With Booze. 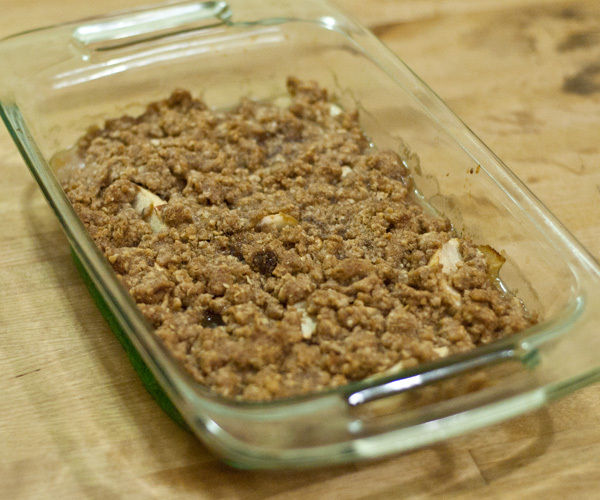 I got this recipe for Apple Crisp from Epicurious and made some minor adjustments, namely, I added Oats and Booze. In a medium bowl, whisk together the flour, oats, brown sugar, cinnamon, and salt. Add the butter pieces and use your fingers to rub the mixture together until the butter is incorporated and the mixture resembles coarse crumbs. Cover with plastic wrap and place in the refrigerator to chill while you prepare the apple filling. Peel the apples and cut them in half lengthwise. Scoop out the cores and discard. 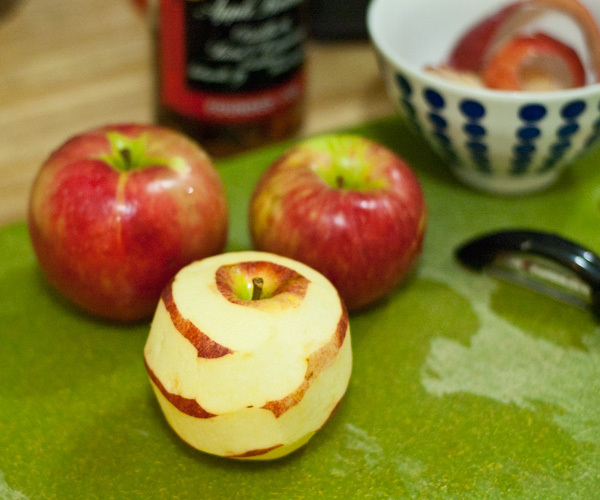 Cut the apple halves lengthwise into 1/2- to 3/4-inch-thick slices—there should be about 6 cups total. Transfer the apple slices to an ungreased 8-inch-square baking dish and spread them out evenly. 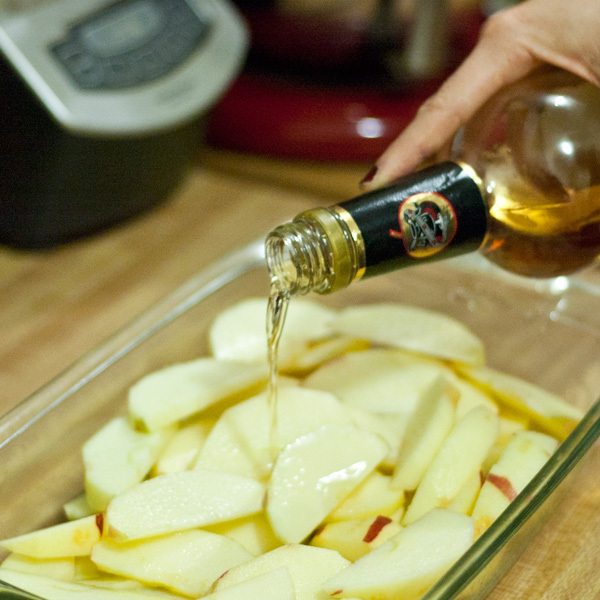 Drizzle up to 1/4 cup of water AND 1 oz Apple Brandy over the apples—use less water if the apples are particularly juicy. Scatter the crisp topping evenly over the fruit without pressing down on it. Bake until the topping is browned, the apples are tender when pierced with a knife, and the juices are bubbling, about 45 to 50 minutes. Transfer to a wire rack to cool for 10 minutes. Serve warm, with or without a scoop of Plain Whole Milk Yoghurt. Do you cook or bake with booze? Would you like to share a recipe? Send recipe and photo to HomeBarGirl@gmail.com!